Money Secrets of the Amish, by Lorilee Craker is jam-packed with practical, down-to-earth wisdom from the Plain People. Probably most of us want to stop being slaves to money and start living the good life. The Amish have a reputation for living well on less, consequently, it might help to find out how they do it. A “worldly” woman with a Mennonite background, Lorilee Craker is in a unique position to connect with the Amish. She introduces us to Amish farmers, housewives and church leaders, coaxing their secrets from them while sharing homemade artisan cheese and fresh garden veggies. As a result, she is able to provide insight for us into how this group of people thrives without credit cards, enormous mortgages, or six-figure incomes. With amusing anecdotes and real-life stories, the author and her friends go from over-extended to simple and satisfied, all while making it look like common sense. My grandma and mom endured the Great Depression, so my childhood abounded in these tried and true methods of acheiving abundance with very little. These suggestions have also helped me get back on track when I have foolishly overextended myself. Lorilee ends each chapter with her own Amish Money Makeover tips, especially relevant for practical application in a non-Amish life. 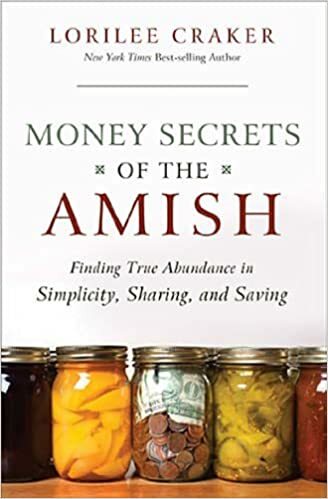 Money Secrets of the Amish is a great resource, first for rebooting your attitude and outlook on money and possessions. In addition, it provides simple, sensible instructions for putting that reboot into practice. A useful reference for every home library, with links to helpful websites, also. I bought the Kindle version from Amazon. No compensation was received for this review.